Tagged vampire, werewolf Edit "Werewolves Vs. Vampires: Round Two"
Well, they’re definitely not as smart. But not as cunning? Only time will tell. LOL!! That last panel takes a second to think about, but I love it. It’s like the Underworld movies, but with better plot and effects! 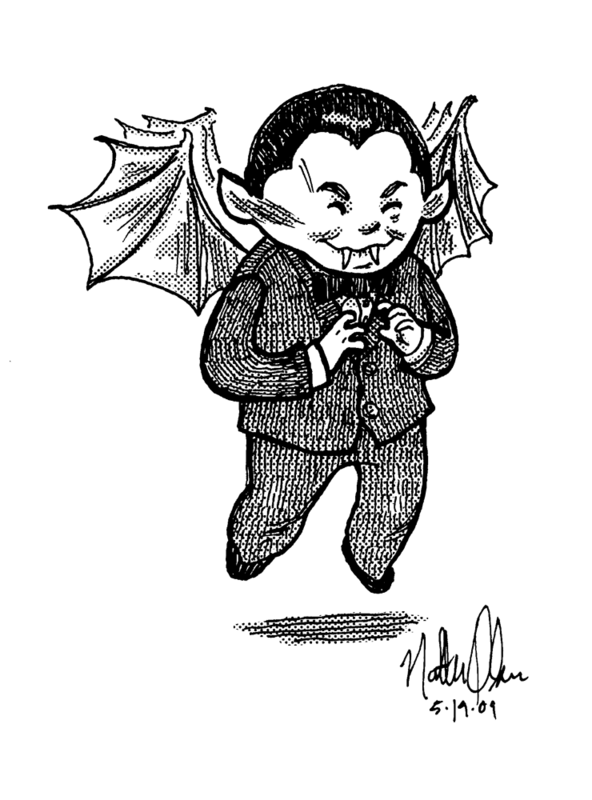 By the way, I posted a bonus vampire sketch on Twitter yesterday. You can see it here. I don’t tweet much, but I have been using Twitter to post some sketches that don’t seem to warrant a full post on their own. If you’d like to follow me, I am here. at least they dont sparkle. Our vampires will never sparkle. That’s a promise. “Tripwire activates surprise” is 8 syllables: trip-wi-re ac-ti-vates sur-prise. Tripwire is pronounced trip-why-er. Heh, I have a feeling that your post is going to drive my brother crazy. Excellent work! Believe it or not, wire is a single syllable. This is according to The American Heritage Dictionary and any other one you pick up. Yes, it sounds like it should be 2 syllables, but it is only one. Tripwire is 2 syllables based on that and by looking it up in the dictionary. Well, any dictionary I have picked up has wire as 1 syllable and tripwire as 2 syllables. This includes dictionary.com and merriam-webster.com. I can only go by dictionaries so if someone can show me one where tripwire is 3 syllables or wire is 2 syllables, let me know. And what about words like child and wire? How many syllables are they? Both are technically single syllable words, but many people pronounce them as two syllables. The vowel sound in child is a diphthong, whereas wire contains a triphthong. In either case it’s easy to slip a schwa in at the end. Purists may object to this “sloppy” pronunciation, but that doesn’t change the fact that it is common. Sorry Calvin, it looks like you’re wrong about this one, but keep counting those syllables! One these days you’re bound to win yourself a no-prize!